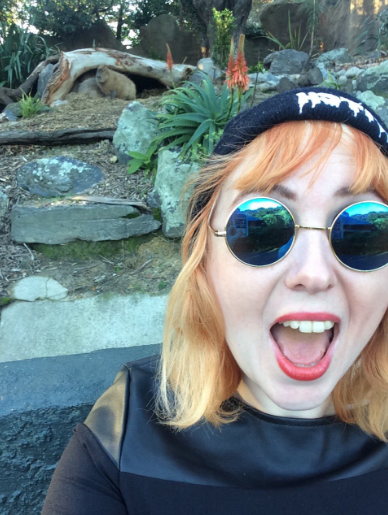 I started writing this blog while slightly hungover after the Visa Wellington on a Plate launch party, and I’ll finish it slightly drunk. Or at least that’s what I thought two nights ago when I got in after work (and after a couple of after-work drinks); when I woke up on Sunday morning I realised I’d been distinctly less productive than how it felt at the time, and had to delete a very rambling paragraph where I tried valiantly to really convince you of the specificity of the tanginess of buttermilk. This is what happens when I miss out on my window of opportunity to write solidly! On the upside “The Specificity of the Tanginess of Buttermilk” sounds 100% like a lesbian novel set in the 60s that would get adapted into an acclaimed and beautiful but ultimately award-snubbed feature film, doesn’t it? It was now a whole week ago that I made this, but it resonates still: a risotto containing not much at all but somehow still incredibly full of flavour depths and things of interest to your tastebuds. Walnuts toasted in butter, sizzled capers, slightly crisp from the heat, miso paste and buttermilk. 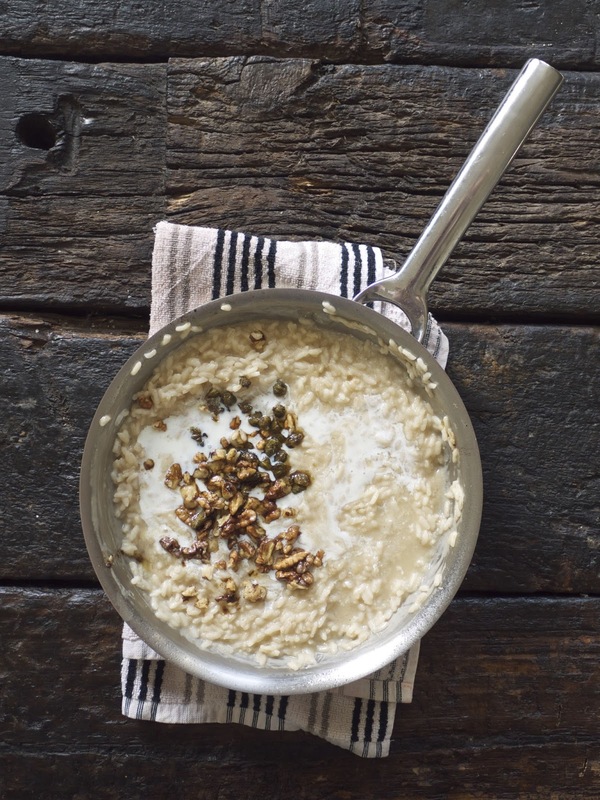 The miso paste acts like an instagram filter, boosting everything it touches while still leaving the original risotto below fairly unchanged. The buttermilk, even more than the miso, is the magic ingredient here – it gives the aforementioned specific tanginess that echoes thick Greek yoghurt or sour cream, but somehow still gives a creaminess to the texture as well. It makes the richness of the browned butter more sharpened without making the overall dish too heavy. It’s just really good. You end up with this aggressively simple yet deeply-toned dish that’s as intensely comforting to eat – all soft and warm and creamy – as it is to make. Or at least, I find risotto comforting to make, all that endless stirring of the rice as it slowly, slowly swells and cooks becomes meditative, like white noise in food form. In Nigella Lawson’s book Kitchen she refers to it as “the solace of stirring”, and the result is threefold, TBH – as well as the cooking and eating of risotto being calming, reading about Nigella describing the calming nature of risotto is honestly the most soothing thing ever. Fill a kettle with water and bring to the boil. (You’ll be using this in a bit to top up the risotto as it’s cooking.) Melt the butter in a saucepan and then tip in the walnuts. Once they’re lightly browned remove them from the pan and set aside (I just put them on the plate I was planning to eat my cooked risotto on) and then throw in the capers. Once the capers are thoroughly sizzled, remove them to the same plate as the walnuts, and pour in the rice. Stir the grains in the butter so they’re all covered and get a chance to toast a little, then pour in the vermouth – it will hit the pan with a hiss and smell amazing. Once it’s absorbed, crumble in the stock cube and stir in the miso paste. 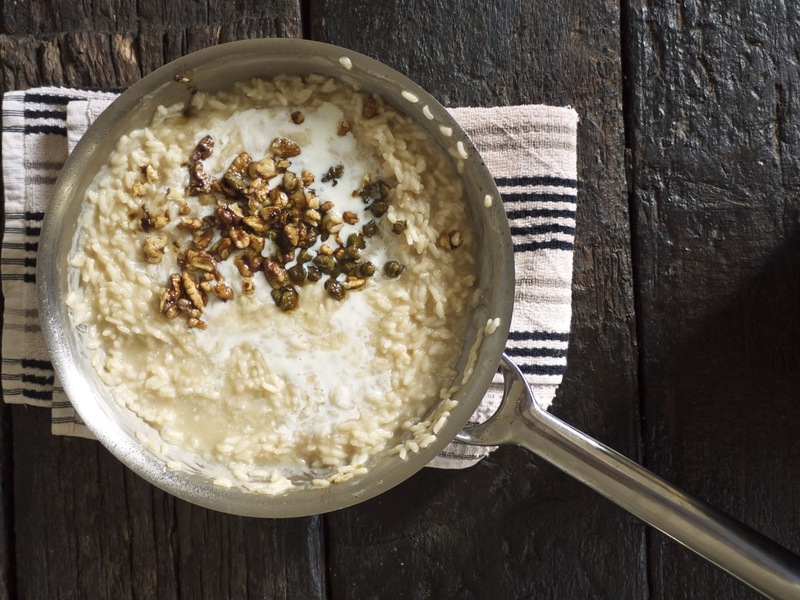 Pour in some hot water from the kettle and start your stirring process – just keep stirring over a medium heat till the rice grains have absorbed it all, then add more. This will take a good twenty minutes and there’s no way around it, but it’s nice to just stand there in a trance over a warm pan. 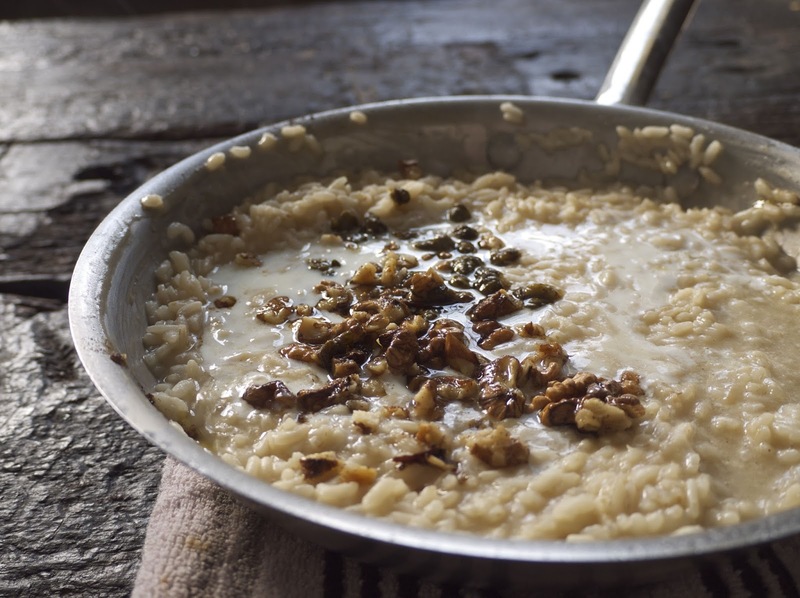 Once the rice is thoroughly cooked, all soft and creamy but with a tiny bit of bite, remove from the heat and stir in the buttermilk – adding more if you like – and tip over the walnuts and capers, scraping in any browned butter that has pooled under them. Stir in more actual butter if you like (I always do) and serve immediately. I tried turning the leftovers into arancini but they fell apart pretty well immediately (to which I was like “I can relate to this”) but having swiped a forkful of the cold risotto before adding eggs and breadcrumbs and then ruining everything, I can attest to the fact that it definitely keeps well. 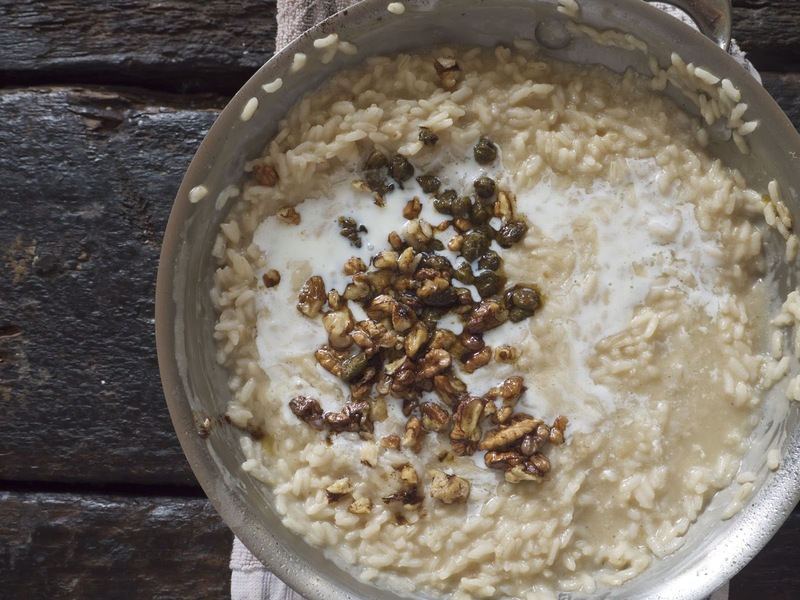 The walnuts can be changed out for whatever nut you like, but I did choose them on purpose – their autumnal butteriness and soft bite is the only interruption I want in this otherwise formless bowl of rice. Back to where I started on this post, I would like to reiterate that the Visa Wellington on a Plate launch was super cool! I ate lots of gin and elderflower jelly and drank many chardonnays (I once had a dream about chardonnay where it was described as “buttery and rowdy” and I swear that’s how all chardonnays have presented themselves to me since) and hung out with cool people and hooned much fernet and champagne at the extremely great Noble Rot wine bar launch afterwards. Never mind moderation, I’m about spending three weeks in bed followed by sand-blasting myself with glamour and fanciness for 24 hours. 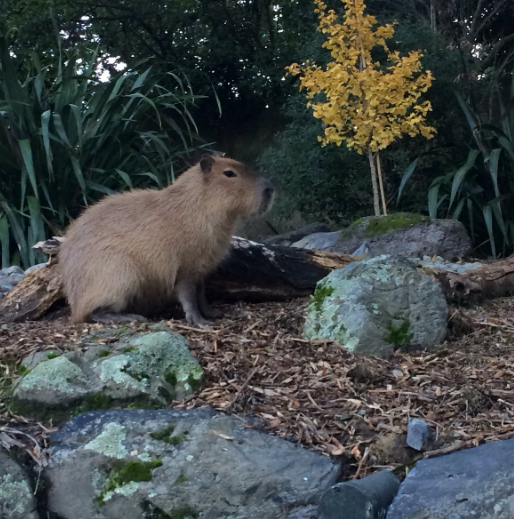 Better than any fancy event this week however was the fact that I finally saw a capybara IRL after being fans of them for many years, and five years on from my tragic (tragic, I tell you!) and fruitless wait at the Berlin Zoo to try and see them. There are FOUR of them at the Wellington Zoo direct from Paris – how sophisticated – and seeing their beautifully regal, yet utterly dingus-y faces today made five-years-ago me feel finally at peace. So calm. Like a risotto. PS: If you enjoyed reading about this risotto and want to immerse yourself in the damn stuff, please consider considering this Oven-baked Risotto and this Pea Risotto that I’ve also blogged about here. title from: Eleanor Rigby by The Beatles, although for many years I genuinely believed my dad wrote this song because his band did a cover of it and so my first introduction to it was hearing them play it during their Sunday band practices. The Cribs, Mirror Kissers. Whatchu know about 2006 nostalgia? Joan Osborne, Right Hand Man. This song goes OFF and I don’t know how that What if God Was One of Us song became her only real big hit when this one is so big and hitty. next time: I made a big lunch for my two best friends and I’m gonna blog about it!